Bach's Violin Concertos (BWV 1041 in A Minor, BWV1042 in E Major and BWV1043, the Double Violin Concerto in D Minor) were written while he was the conductor of the court orchestra in Cöthen, between 1717 and 1723. 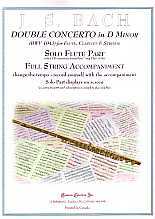 In this arrangement of the Double Concerto BWV1043, the Flute plays the 1st Violin part and the Bb Clarinet plays 2nd Violin. 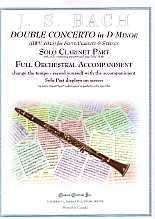 The only real departure from the original Solo parts occurs in the 3rd Movement in the two sections of double stops (where the Solo Violins play two notes at the same time) which have been replaced by a more typical woodwind figure.